In the late 1600's to the late 1700's copper coinage was produced sporadically, sometimes not at all, for various reasons. Conder Tokens (named after James Conder) are copper coins (usually pennies and half pennies) Printed by towns, businesses, and organizations of all types to meet a need for low denomination coinage to pay wages and make change. Thousands of varieties of tokens were minted and many are beautiful and intricate. About Sir Isaac Newton: This Halfpenny depicts Isaac Newton, president of the Royal Society from January 4,1643 to March 31, 1727. He was an English mathematician, physicist, astronomer, alchemist, chemist, inventor, and natural philosopher. 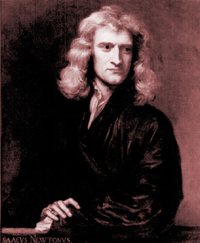 Newton wrote the Philosophiae Naturalis Principia Mathematica in which he described universal gravitation and the three laws of motion, laying the groundwork for classical mechanics. By deriving Kepler's laws of planetary motion from this system, he was the first to show that the motion of objects on Earth and of celestial bodies are governed by the same set of natural laws. The unifying and deterministic power of his laws was integral to the scientific revolution and the advancement of heliocentrism. Newton played a major role in the history of calculus, sharing credit with Gottfried Leibniz. He also made contributions to other areas of mathematics, for example the generalized binomial theorem. The mathematician and mathematical physicist Joseph Louis Lagrange (1736–1813), said that "Newton was the greatest genius that ever existed and the most fortunate, for we cannot find more than once a system of the world to establish."